Thank you for joining us for our Fun With Felt Challenge! We hope you will join in with our new theme this week! Yes, it’s everyone’s favorite challenge! Just make sure your projects are NEW projects! We love seeing all of your awesome entries for the Anything Goes challenges! We are showcasing Technique Tuesday Products this week. You don’t have to use them to join in with the challenge, but if you have them we would love to see them used! Technique Tuesday offers unique products that you just can’t find anywhere else. Be sure to check out the great selection in the Simon Says Stamp store! I have used Technique Tuesday Garden Flowers die on my card. I used Dylusions spray on white cardstock and saturated it. Then die cut the outline and the solid flowers using the die. I layered glued them. I did this with six different colours of Dylusions. I made three layered flowers. Just swapped the centres of the flowers to different colours. The leaves are from Simon Says Stamp Clustered Leaves dies cut using vellum cardstock. The sentiment is part of the Technique Tuesday Garden Flowers die set. I simply die cut them using black cardstock. 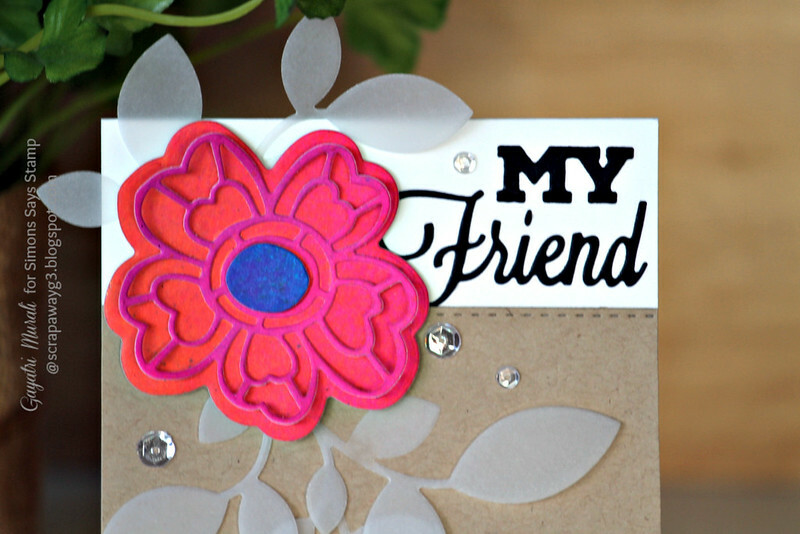 The kraft layer is die cut using Simon Says Stamp largest stitched rectangle die. Finally embellished with Pretty Pink Posh Sparkly Clear sequins. There are fabulous giveaways and inspiration from amazing designers on a daily basis over on the Simon Says Stamp Blog. If you haven’t subscribed by email you may want to so you don’t miss out! So pretty inthese bright colours. A super card Gayatri, a lovely design with gorgeous vellum printsteps with the gorgeous flowers, sprint stps and supef sentiment details!! 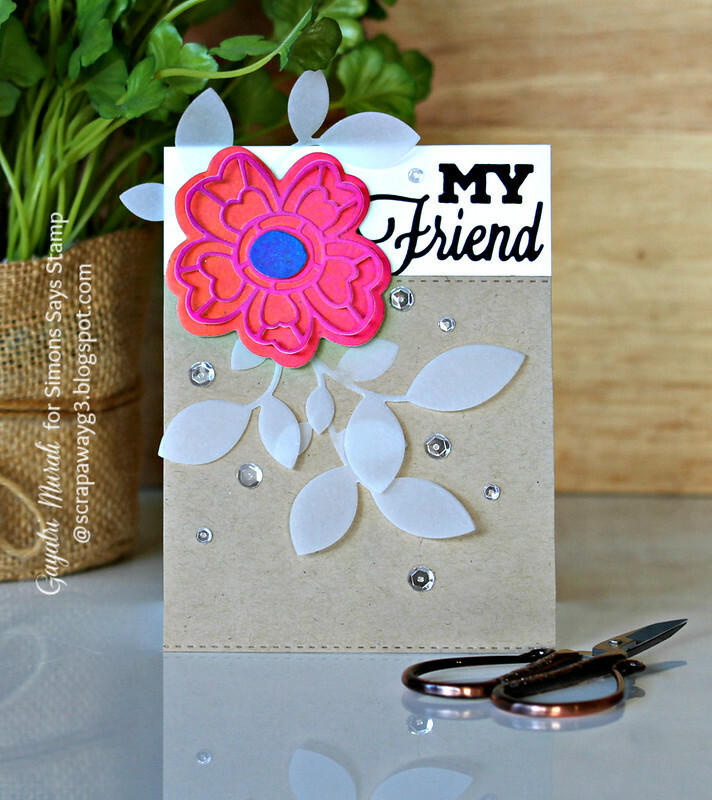 Love the bright colors, and the vellum leaves, Gayatri! The kraft shows them off beautifully! Neat design, Gayatri! Love the vellum leaves!! Very creative use of die cutting. TFS! Love the bright colour! Very pretty card!